As a landlord, you have several options for collecting a court ordered money judgment against a tenant in California. However, one of the most important steps in evicting your tenant and collecting an Unlawful Detainer judgment is the preparation of a detailed file on the tenant beginning with your very first interactions with them. You want to get as much background information on your tenant as you can and keep it well organized in their file. The first step in getting information from your tenant is the rental application. The rental application should require as much background information on your tenant as you can get. The application must require the full name, including all prior names the prospective tenant has used. It should require the tenants Driver’s License Number or California ID, the name address and telephone number of at least three references and two relatives. It should also require the listing of the name, address and telephone numbers of all landlords within the past five years. The tenant’s employment information is also a very important piece of information that should be required in the Rental Application. There should be a place for tenant to include the name, address and telephone number of each employer during the past five years. Education history is also another piece of information that can be requested in the rental application. The following documents should also be requested for the tenant file. 1) A copy of the tenant’s driver’s license and/or California ID: 2) A copy of the tenant’s last three pay stubs; and a copy of any utility bill. Why is this information so important? The more information you obtain from a prospective tenant at the application stage will assist you in screening the tenant for potential eviction risks. It will also assist you in the collection of a money judgment if you ever have to evict the tenant. The most important part of the eviction case is getting possession of the property. That is the first and most essential role of an experienced eviction attorney so you are able to find new tenants and stop the rent loss on your rental unit. Secondary to obtaining possession of the rental property is obtaining a money judgment associated with your Unlawful Detainer case for unpaid rent, holdover damages, attorney fees (if allowed by the rental agreement) and court costs. There are several ways a landlord in California can obtain a money judgment for Unlawful Detainer during and after evicting a tenant. The landlord can obtain a money judgment for unpaid rent, holdover damages, attorney fees (if allowed by the rental agreement) and court costs as part of the eviction judgment if allowed by the court. However, most courts are reluctant to give a landlord a judgment for possession and monetary damages if the eviction case goes by way of a default and is not contested by the tenant. If the court does not allow a money judgment in the eviction portion of the case the landlord can obtain the money judgment by filing an application for Default Judgment with a Code of Civil Procedure 585 Declaration. A California landlord can also limit the Judgment in the eviction case to possession only and file a Small Claims Case if the unpaid rent, holdover damages, and attorney fees are less than $10,000.00. Fast Eviction Service provides a Small Claims Department to assist our clients in obtaining a monetary judgment for our clients for a nominal fee. California landlords can also file a general civil case against the tenant if the damages exceed $10,000.00. There are two types of general civil cases. First, there is the limited civil cases which limit the damages that can be recovered to under $25,000.00. The process is quick and much less expensive than the unlimited civil case which allows for damages exceeding $25,000.00. Preparation for any type of civil lawsuit against a tenant after eviction, whether it be a Small Claims lawsuit, or a general civil action is very important. Before filing the landlord must gather all the evidence the landlord intends on using. First, the landlord must insure that the Security Deposit has been fully dealt with. California Law requires a landlord to send a tenant, within 21 days of vacating the rental property, an itemized accounting of how security was used. Generally, a security deposit can be used to reimburse the landlord for any necessary repairs and clean up, beyond normal wear and tear that was required to make the rental property ready for re-rental. It is very important that the landlord take photographs and/or a video of the rental property after the landlord regains possession after an eviction and the tenant has vacated. The Security Disposition Notice and Accounting must be mailed to the tenant at the tenants forwarding address, if known, or the last known address 21 days after the tenant has vacated the rental property along with the receipts for costs of repairs and materials. If the tenant is owed any money from the Security Deposit after deducting the unpaid rent, costs for the repairs and materials a check must be cut and mailed to the tenant with the Security Deposit Notice and Accounting. If the landlord is owed money after the security deposit is fully accounted for the landlord can and should file a civil action against the tenant for the balance owed. Once a judgment has been obtained against the tenant it is time for collection of the judgment. Fast Eviction Service offers a very experienced collection department that can assist any landlord in collecting any size of judgment. The collection of any civil judgment, including a judgment against a tenant, takes time and money. The information you obtain in the rental application can be of great assistance collecting on the judgment. Sometimes a judgment needs to be seasoned over time during which an additional 10% per year in interest is added to the judgment. The Fast Eviction Collection Department does not charge any upfront fees for costs and/or attorney fees and handles all collection matters on a contingency basis. Any money recovered by the Fast Eviction Collection Department is split on a 60/40 basis with the client received 60% of the dollars collected. This is unlike most other collection firms and agencies that charge up to 50% of the dollars collect and will also charge for reimbursement of expenses. In California a court ordered judgment is good for 10 years and can be renewed for an additional 10 years. 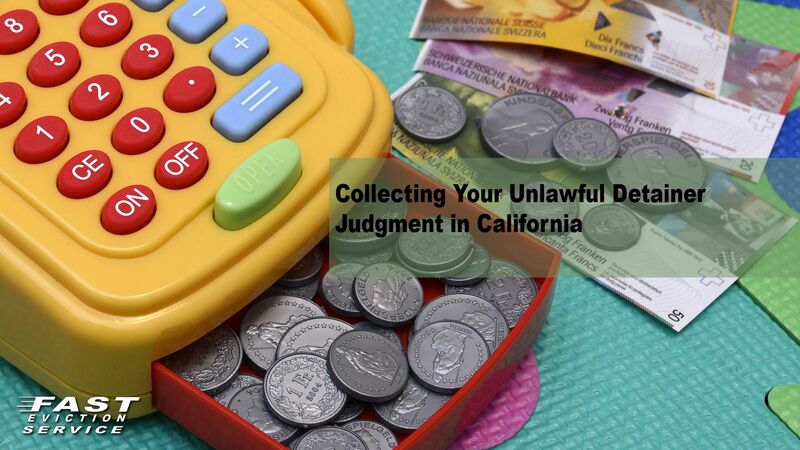 To be successful collecting a cash judgment on your Unlawful Detainer judgment in California you must know the law and act accordingly.